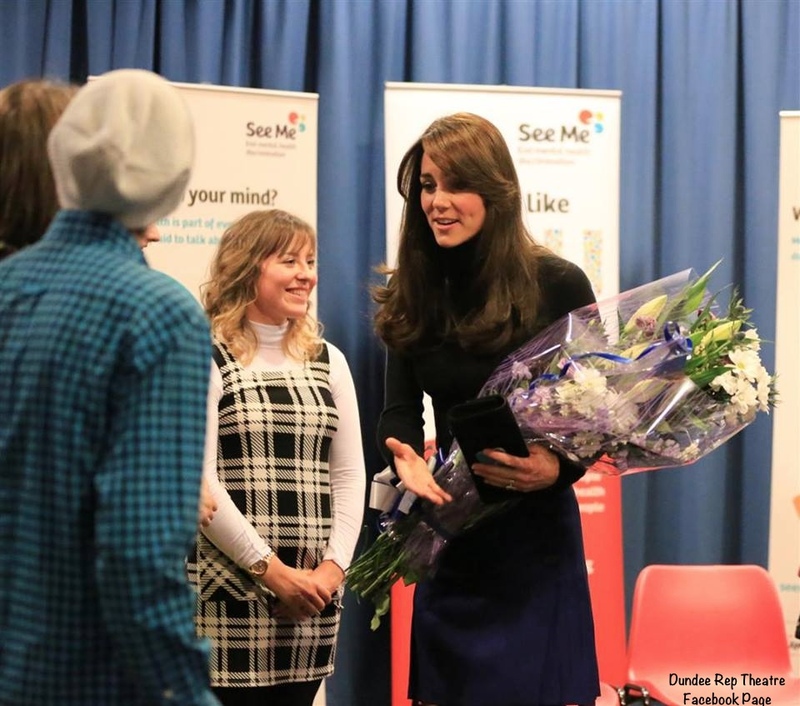 Kate and William’s focus on mental health issues and young people coping with the stigma associated with such challenges continued today with multiple engagements in Dundee, Scotland. The Countess wore a bespoke ensemble by Scottish-born designer Christopher Kane. Crowds gathered to greet the couple at their first stop in a busy day of engagements, Dundee Rep Theatre. The Theatre is considered a national asset and home to multiple companies, including the Rep Ensemble and Scottish Dance Theatre. 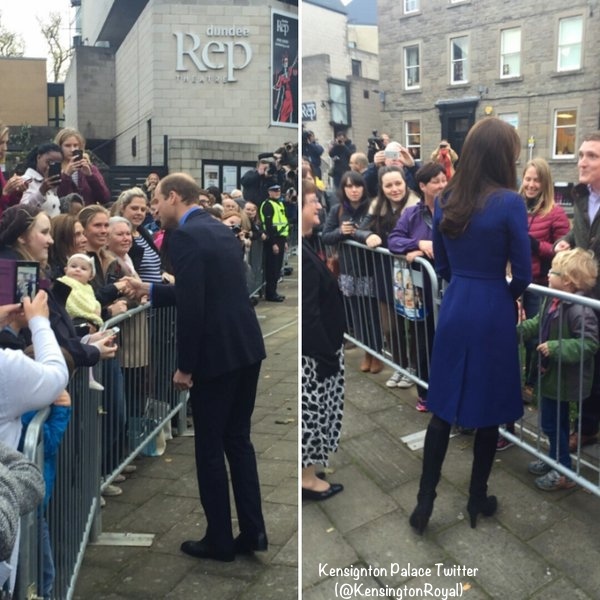 William and Kate were both regular visitors to the city when they were St Andrews. “I have very fond‎ memories of coming to Dundee when I was a student,” she told a group of Dundee University students, including medical student Claire Gilmore, 22. “We told her we were missing lectures to come here,” Claire said. “We’re going to get you into trouble,” Kate said. 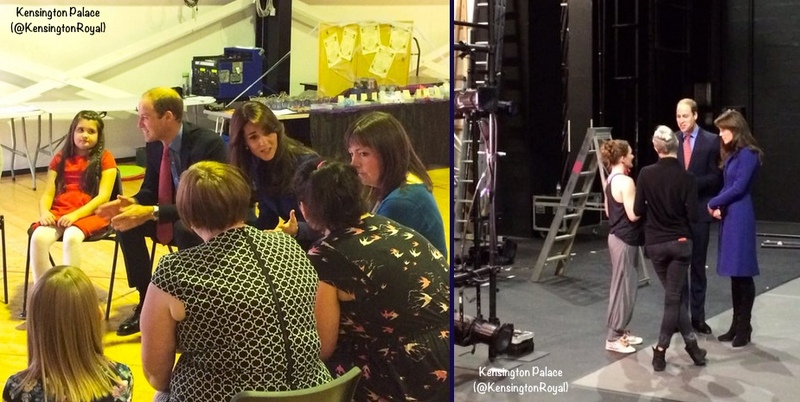 One young lady managed to meet Kate personally, and kindly shared her photos. 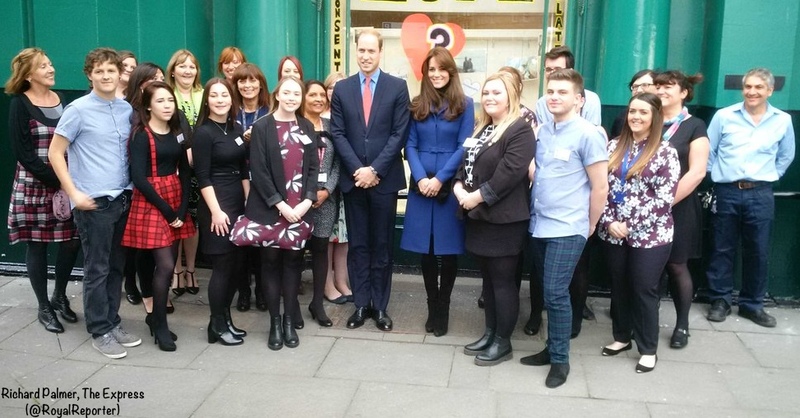 Some will recognize Kate’s private secretary, Rebecca Deacon, in the background of the photo. While speaking with the crowds William shared how he felt about math as a student. 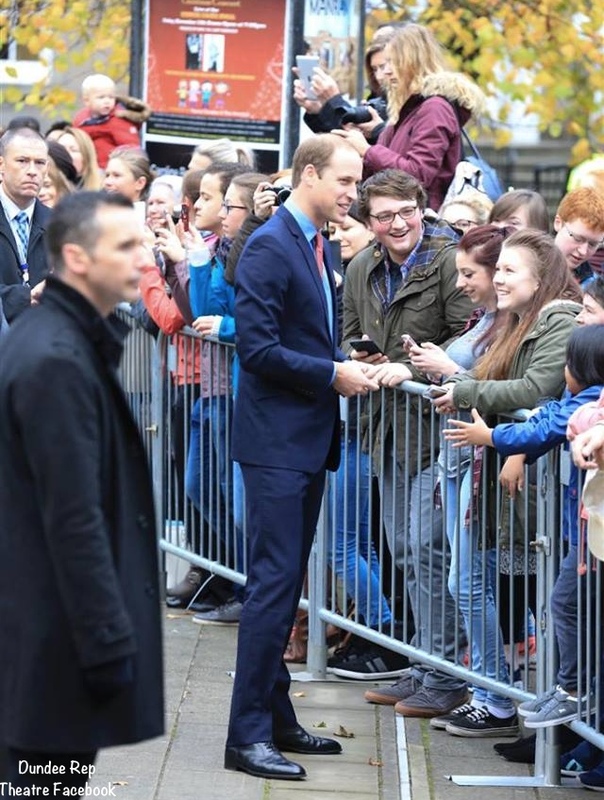 William also confessed to one eight-year-old girl that he didn’t like maths when she told him it was her favourite subject. He said that he didn’t like maths. It was cool to meet them but I was kind of scared. At the Theatre one of the activities involved the Theatre’s Dramatherapy program, and another was a workshop with young people helped by mental health charities. The Cambridges met the staff and crew behind a moving and thought provoking piece, In Her Shadows, a visual performance that explores a young woman’s relationship with her depression – and highlights the stigmas surround the illness. 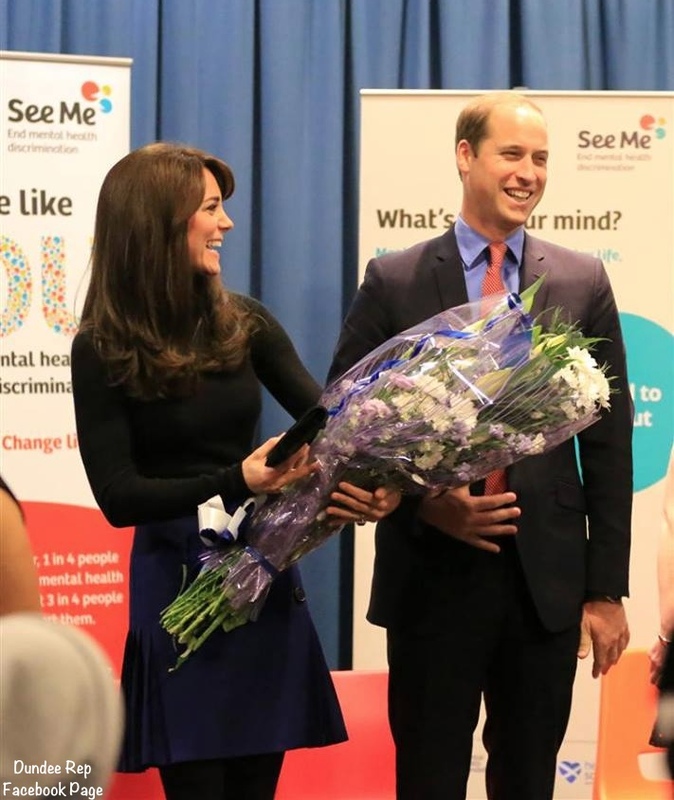 While at the Theatre Kate and William also heard from staff and volunteers with See Me Scotland. 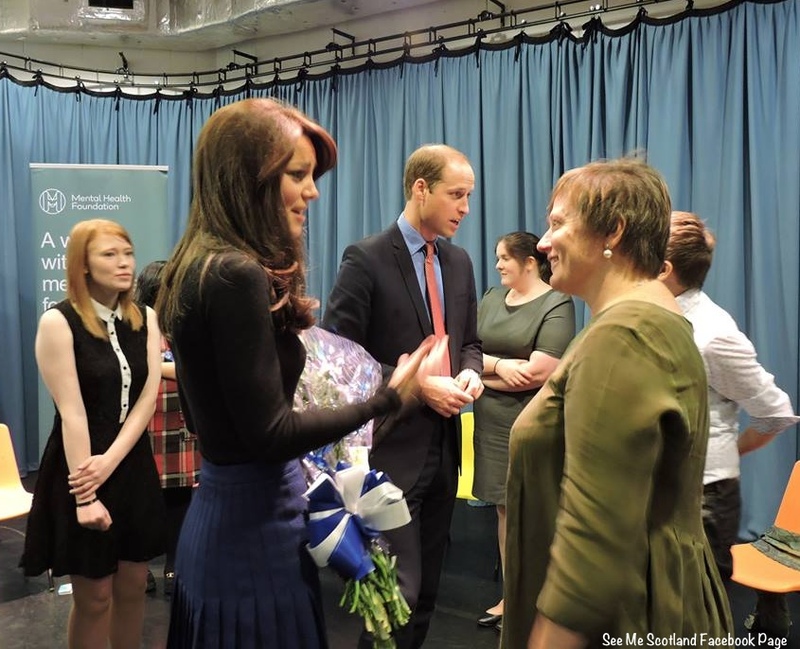 They discussed the need for a culture shift in Scotland, with open discussions on mental health starting in schools. 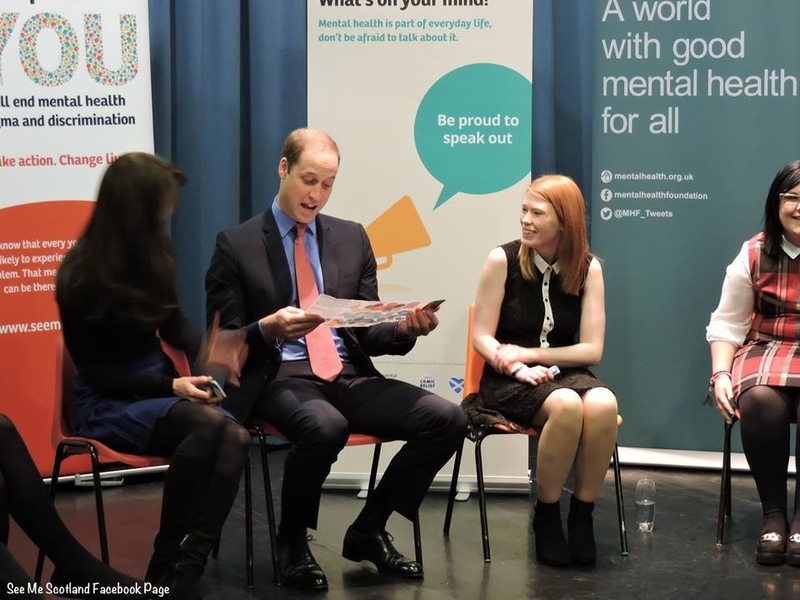 Kate and William also learned about the organization’s What’s On Your Mind card, being used in a pilot program to help make mental health a daily topic of conversation. Then it was time to head for the next stop on the agenda. 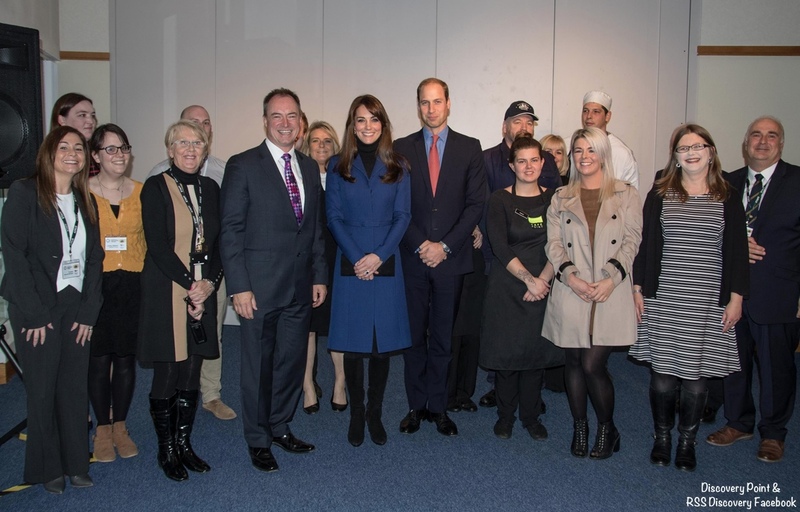 Continuing with the mental health agenda, William and Kate attended an anti-bullying workshop at a local drop-in center, The Corner. Richard Palmer shared this photo of the couple with young people at The Corner. All the nerves disappeared once everyone met the Earl and Countess. Thank you to all involved in raising the profile of mental health issues and bullying especially the young people who dealt with the whole occasion with ease, calm and even some jokes! This was clearly a series of events the two were very much engaged with, and enjoying, despite the tough topics covered at several events. There were other fun anecdotes from the morning, including this one about William and Kate’s dancing skills. The Mirror’s blog quotes Claire Wallace, a young mother. They were very friendly and asking a lot of questions about the group. They were asking if we did dancing and someone told them yes, Scottish country dancing, and I asked them did you try Scottish country dancing at St Andrews. The Earl and Countess were given a gift of several books authored by the UK’s Roald Dahl for Prince George and Princess Charlotte. 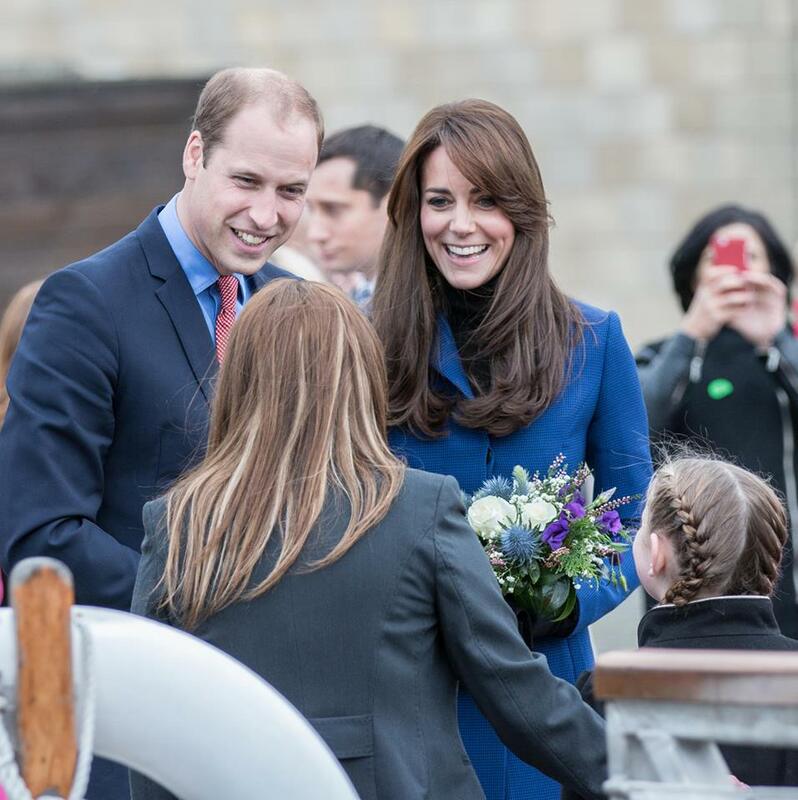 Kate and William also visited Discovery Dundee, home to the tall ship Discovery, which carried Captain Robert Scott and explorer Earnest Shackleton on their historic voyage to Antarctica in 1901. The RRS (Royal Research Ship) Discovery ship was built in Dundee, and is now part of an permanent exhibition and park in the heart of the city. The look at the little girl’s face lower right is precious. 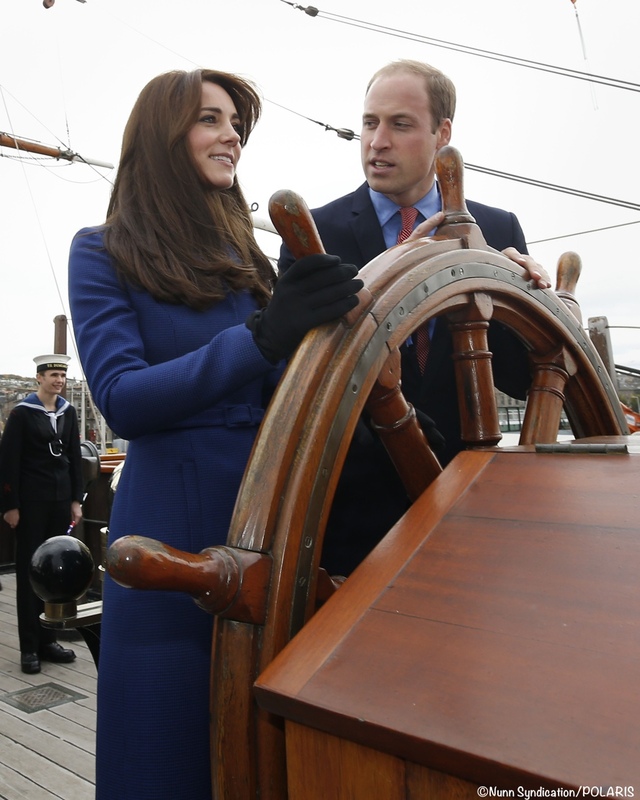 William and Kate at the helm of the Discovery. The Discovery Point staff with TRH. The Earl and Countess with another Discovery Point staffer. It’s been amazing meeting so many people just like me, because back at home there aren’t many people who make games like I do. I mean, there are loads that play games, but not many who make them. Being a games designer is definitely what I want to do. On to what Kate wore for today’s visit to Dundee. As noted, she went with Scottish-born designer Christopher Kane, wearing a coat and matching kilt-style dress. Previously Kate wore a bespoke coat by the designer for the Olympic Games opening ceremony in 2012. We saw that garment again for Order of the Garter in 2014. This graphic illustrates (hopefully) how very much alike the two coats are: the silhouette is much the same; other shared elements include princess seaming, on-seam pockets, hidden/covered placket, small lapels, and a slim self-belt. Kate’s dress hit above the knee, and appeared to have a black turtleneck (polo neck in the UK) on the top and a kilt-style skirt on the bottom. This offers a better look at the matching skirt worn beneath the coat. Another look at Kate in the dress while at Dundee Rep, via the Theatre’s Facebook page. The kilt-style skirt has pleats on both side I believe the interior of each pleat is black to contrast with the blue. and the requisite safety pin. Most will recognize two familiar accessories. 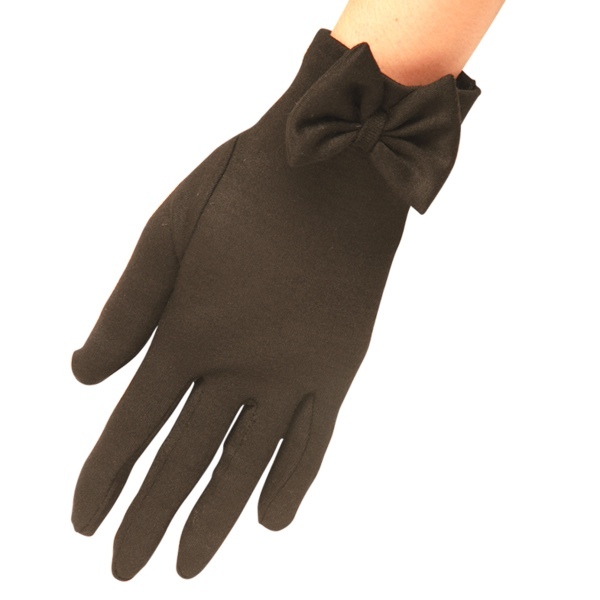 Kate carried (and then wore) her favorite Cornelia James ‘Imogen’ gloves (£70), made of pure Merino wool and adorned with a bow. (And yes, you can order directly from the site now!) 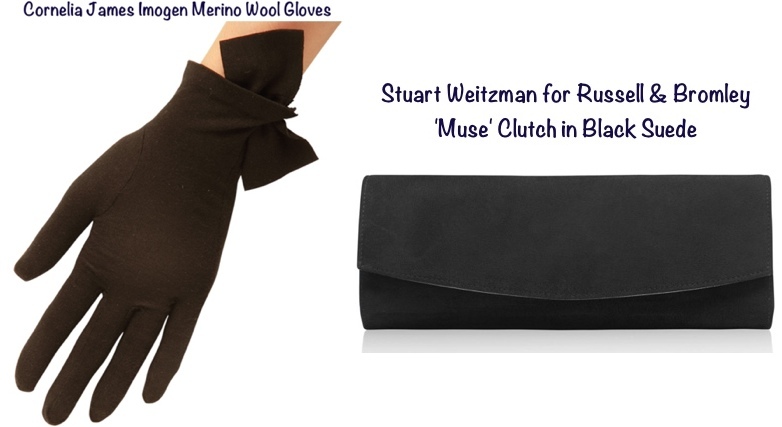 She also carried her ‘Muse’ clutch by Stuart Weitzman, offered in the UK at Russell and Bromley. 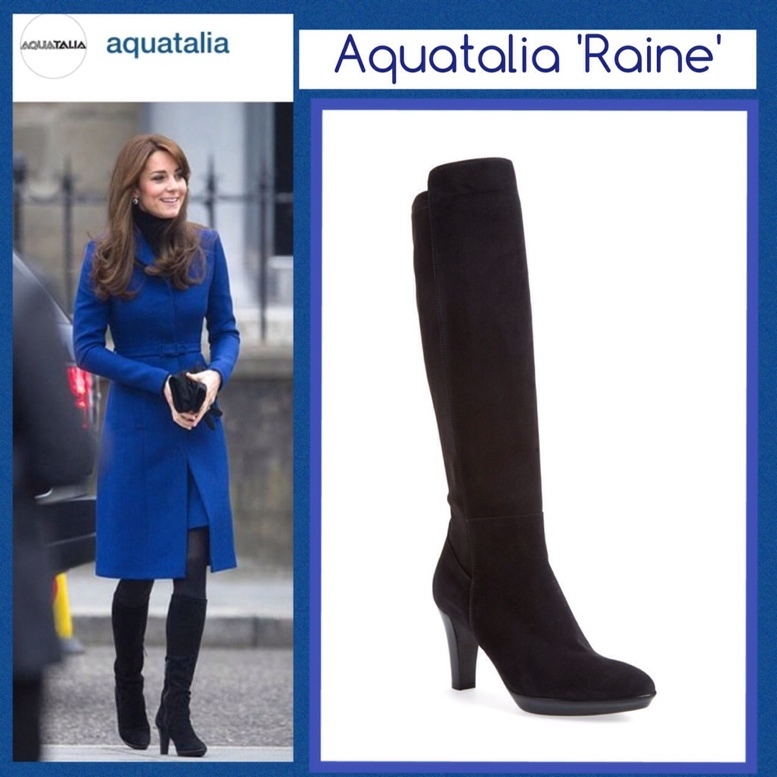 We also saw Kate’s Aquatalia Rhumba boots again, a style that is no longer offered by the brand. The only retailer with any kind of inventory is Jildor Shoes, where the Rhumba is $725. Lord and Taylor has the Rhumba in brown in very limited sizing, it is discounted to $616. Fortunately Aquatalia has released a style that is very similar, the Damara. Below we show the boots side by side; both photos have been digitally treated to better show the styling details. The Damara is offered at Nordstrom, where it is available in most sizes. This style is also $725; the boot is also carried at Lord and Taylor, as well as Bergdorf Goodman. 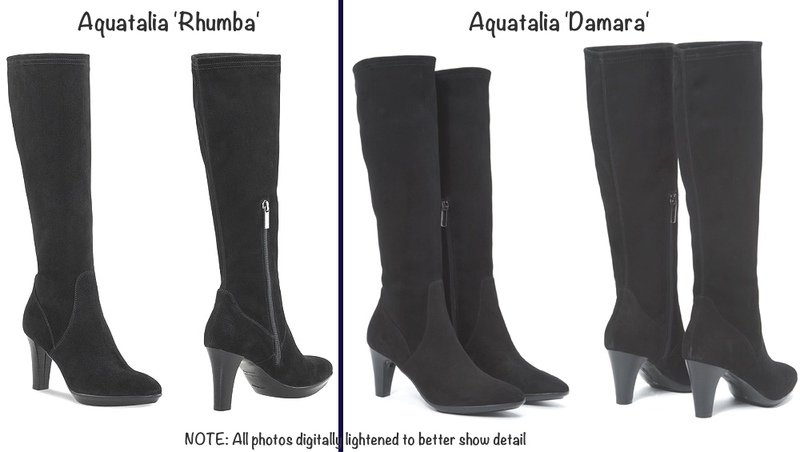 Aquatalia suggests its ‘Raine’ style as a substitute for the Rhumba. The boot is less expensive than the Damara, priced at $650. It is available at Nordstrom (free shipping/returns) and is also offered at Saks, (code FREESHIP) as well as at Neiman Marcus (free shipping, no code required). 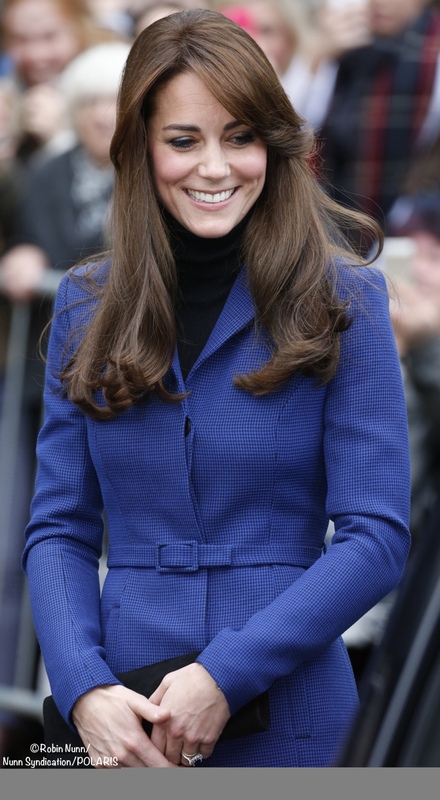 This was a good look for the Duchess, the coat’s cut and color were very flattering. 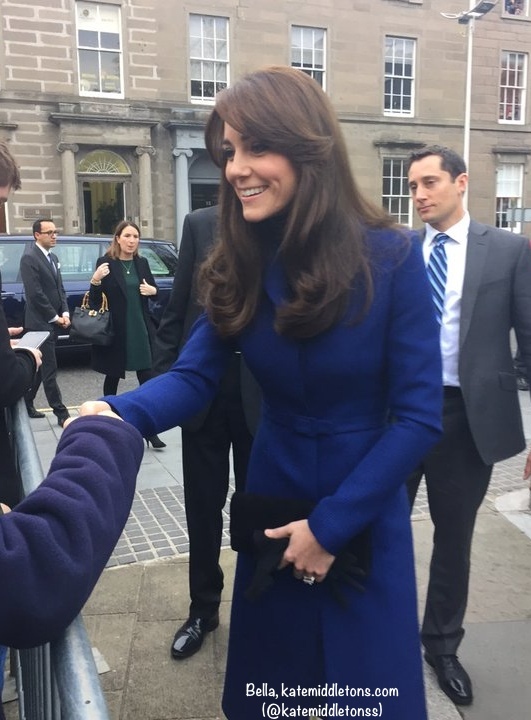 With the two state visit functions behind her Kate seemed relaxed, engaged in the day’s business, and enjoying those she met throughout Dundee. In other news, a very brief note about Remembrance Sunday this year: the service is going to be shortened to allow less time that the Queen and veterans are on their feet. A wise move that is indicative of the ages of those at the core of the service. This year the service falls on November 8. Please forgive the horrible delay with our post today, our internet provider is struggling (there’s a euphemism) to provide uninterrupted service; the signal has been dropping out repeatedly. As many have noted, the interior of each pleat is the same fabric as the kilt, I was wrong in thinking it was black. A wonderful ‘faithful follower’ notes that Kate’s gloves couldn’t be the Imogen, as more photos came out it is clear the bow is not on the side, but in the center. I will fire off a note to Cornelia James. 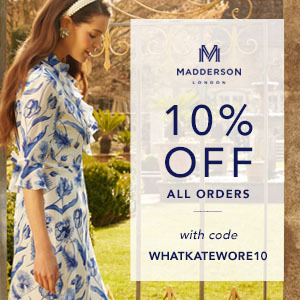 I am wondering if it is possible she is wearing the brand’s ‘Beatrice’ style. Here is a photo that’s been digitally enhanced to show the details. UPDATED: The good folks at Cornelia James tell me they think it *could be* their Beatrice. But on closer look it seems the bows are a little bit different, while our astute ‘faithful follower’ doesn’t think the way the bows are attached to the glove are the same. UPDATE 2 (NOV 10, 2015) It really does look like we are seeing adifferent pair of gloves, they do not look like they are Cornelia James. I can only see a button on the skirt, not a safety pin. Even if there was a pin, it would certainly not be a safety pin…kilt pin yes, decorative pin maybe but safety pin? That’s only for dress making and fixing bandages. I suspect that the reference to kilted skirt is the fact that it is a pleated skirt, with the pleats looking quite deep this would resemble kilting rather than simply pleating. In respect to being kilted, “mini” may refer to the traditonal length of women’s kilts being mid calf at least, therefore above the knee would be classed as mini. Or whoever wrote that doesn’t really know but seeing as they were in Dundee rather than referring simply to a skirt upped the cliché. I LOVE EVERYTHING ABOUT THIS OUTFIT!!!!! I enjoyed reading about this visit and how they are working to de-stigmatize mental health issues. All the clothes, hair and makeup aside, what makes me really love Kate is human compassion. The charities and organizations she chooses to be spokesperson for seem to focus on human well-being, a healthy soul if you will, and I find that very admirable of her. I read a lot of comments on Kate’s new hair. I agree with all that her hair looked very nice in 2011-2012, but I must admit that I got a bit bored by the princess-like curls. I love her new look! In my view it is more mature and it suits her very well. Especially the bangs make her look more interesting. While I truly always love what Kate wears, I am really not a fan of this look. The colour is absolutely beautiful and incredibly complimentary to Kate’s colouring (and opposed to many other comments, I don’t have any problem with either the length of the skirt or the boots). I struggled with the tailoring of the last Christopher Kane coat, and I continue to struggle here – something about this coat just seems…. Off. The two styles are relatively identical, and the same intangible feeling of it not fitting her petite frame properly echoes from one look to the next – I do not see any of the impeccable tailoring of a McQueen or a Packham. The material, while I’m sure expensive as one would expect of any bespoke piece, appears cheap and too lightly textured for a coat for this time of year. Overall, a total miss in my eyes, but wonderful in colour and in theory – Kate should skip Christopher Kane in the future – does anyone have any of his pieces and have an opinion they are willing to share? I really like this outfit! The rich blue is stunning. I disagree that the kilted skirt is too short. It’s youthful and fun while still operating within Kate’s fairly conservative style. I think it would have looked matronly had it been significantly longer. As others mentioned, I like that she took her coat off when she was inside and agree it makes her seem more engaged in the event. I think that Kate looks great in this outfit. Lovely colour, super stylish and overall it has a feeling of youthfulness to it with the style and length of the skirt. Not easy to keep a fitted coat with matching skirt looking young and slightly hip but Kate has managed it. I think the pattern of the fabric is great – overall a lovely look. I don’t usually comment on Kate’s makeup but I think it looks wonderful in these photos. How difficult it must be to be photographed so much – you would certainly want to ensure that your makeup would last through the entire event. The look is nice and fresh to my eyes. For balling terms a bit, I’d call the skirt a mini, because it’s above the knee. But I see how minis come in much shorter versions as well. I think there’s a “micro” lenght too. Her short skirts don’t contrast with her being royal in my eyes, because I remember seeing some photos of Diana with short ones. In this look I especially like the polo and the really wearable coat with a great shade of blue. What earrings was Kate wearing at today’s engagement? I think she would have looked better if her hair was pulled back…although I think cutting it would be the better solution.I like the houndstooth pattern and it’s worth mentioning that she wears this color very well. Gorgeous coat! Love her makeup too! She actually doesn’t have long legs. She’s very long-waisted, so her legs are short relative to her torso. That helps explains her preference for quite high heels and wedges. I doubt she’ll ever retire those boots unless they truly get beat-up and worn out. I have this exact pair and they are possibly one of the most comfortable pairs of shoes I own, even with the heel height. I believe they’re also waterproof(? ), or at least rain resistant, which probably makes them a safer pick than leather in unpredictable weather situations. I always like visiting this site and appreciate the attention to detail. I’ve never commented before, but I must say it’s a bit annoying when people even mention the length of Kate’s skirts. I know people are entitled to their opinion, and I respect that. (In this instance I plead ignorance regarding the “kilt” length – even though my grandparents are from Glasgow so maybe I should know :/ I am American). I am speculating, but perhaps she didn’t mean for it to be an actual kilt, rather just wanted to have the look of one/that type of style. Wouldn’t her people know these things, so not to be disrespectful, to which ElizaMo alluded? When I played field hockey in high school, we wore pleated skirts and called them kilts (although, these days most players wear Under Armour-type “skorts”, which I did wear in college). I suppose we do use that term loosely, Eliza, like you said. It’s interesting to find out more about Scottish traditions 🙂 I think the length of the skirt, paired with the turtleneck, makes the overall look more youthful and fun, and not so stuffy. If the skirt were longer or the exact length of the coat, I don’t think it would look right. She’s only 33, and I don’t understand why her skirts can’t be a 2-3 inches above the knee. Her legs are incredibly long. I like when they’re a bit shorter, to be honest. I can’t imagine being under that much scrutiny when out in public. People (maybe not on here, but elsewhere) are also constantly commenting about her eyeliner, which I also like. I don’t even think Kate wears THAT much eye makeup. Then again, I like eyeliner and makeup in general, haha. I think that amount probably is what Kate’s comfortable with, and I hope she doesn’t change it just because other people don’t like it. We all have to remember that she is photographed from every angle, in every light, with HD photography. I also love the boots with this look, and I loved them with that red and black suit she wore to St. Andrews. They look chic and, again, modern and youthful coupled with the beautiful, elegant coat. 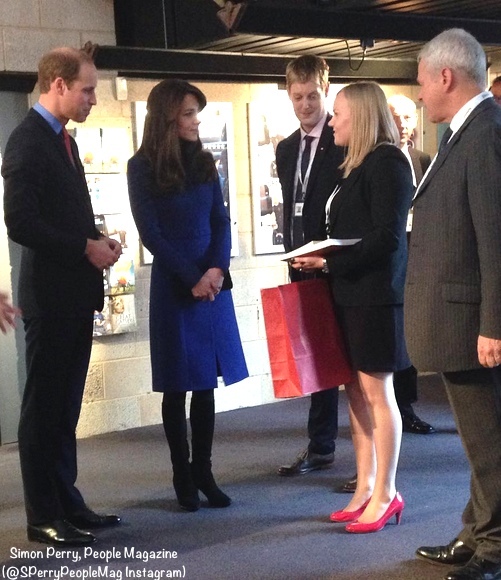 I own the Rhumba boots, and they are quite comfortable – one of the reasons I suspect Kate wears them. When I first tried them on, I could instantly feel the fine craftsmanship and luxury style. They’re still overpriced, but so are most designer items these days. Definitely agree with SuzyQ regarding the hairdresser. James Pryce made her hair look practically perfect every time he styled it, and it looked the best during that time period. If I lived in London and had the money, I would go to him! Nice to hear from you Courtney and welcome to the world of website posters! 🙂 I don’t know if Kate’s advisers would be much up-to-speed on the subject of kilts – they are southerners, after all, poor things! Folks in London tend to know a lot more about almost every other country than the one some 400 miles north of them, but that’s another story. If anything I was surprised that Christopher Kane’s own Scottish antennae weren’t more finely tuned, but as you say it’s no big deal. I’m with you on the question of make-up. I generally like her make-up too and have assumed that the heavier touch deployed sometimes is due to surviving under the glare of flashbulbs. I thought it had softened of late, there seems to be more eyeshadow used without quite as much eyeliner. I’m a makeup artist, so I can explain what is technically wrong with Kate’s eye makeup. In general, people with smaller eyes, lighter colored eyes and light complexions are advised to wear brown eyeliner and to not line the eyes completely because it gives a very dramatic and heavy look, especially for daytime. Black eyeliner on light complexions and blue or green eyes looks very intense. I agree with ElizaMo’s opinion. I think Kate is applying more makeup so she doesn’t look makeup-less under the flash of the cameras. Kate would be better off using a brown eyeliner from the middle of her lashline to the outer corner, gently blending that so it’s not so harsh, then applying a soft beige or white eyeshadow in the inner corner of her eye and blending. I think the people commenting on her eyeliner are bothered by it because she doesn’t blend it enough and it looks like a strong line. What she wears now makes her look older and is not as flattering as it can be. Kate is a beautiful woman and I really like her style. But she could benefit from the assistance of a professional makeup artist to change her makeup technique. Do you remember when she and William attended a 2011 gala where she wore the pinky beige Jenny P dress (my favorite evening dress)? It’s the only time I’ve ever seen her makeup look that professional, in addition to her hair! Whomever the makeup artist was for that event, I sure wish she’d use them again! Her inner and outer kids were lined with what looked to be a shadow first, then liquid liner. She looked like absolute perfection!! Thanks, you put your finger on it. I have smaller eyes, too, and I used to line them completely. A NARS makeup artist told me it only made them look smaller. She switched me to brownish colors, taught me how to blend so that the color was almost an ombre, and also to use a very thin line on the top lid only. She also said if you apply shadow over the liner, you use that “harsh” liner look, but you still get the texture. I think Kate learned to do her makeup in her 20s, when her face was fuller. (Take a look at her graduation photo from St. Andrews.) Now, she needs a softer look. It isn’t the amount of makeup that she wears, it’s the way it’s applied. Some of the new HD makeups provide great coverage and emphasis, but they don’t look as heavy. Yes, I believe Kate uses a heavier hand for events due to the constant flashbulbs going off and the HD photos she knows are being taken. It’s really in the close ups where you sometimes see the unblended line. Her bottom liner varies from time to time. In my opinion, Kate’s makeup has looked best at some [older] evening events, like when she wore the teal Jenny Packham gown and the black velvet Alexander McQueen dress. I don’t think she necessarily needs brown eyeliner. I have a light complexion and green eyes, and I wear black liner. I do usually put a light shadow in the inner corner/tearduct, so that would probably look good on her, as KM Jewelry said. The black can look intense, but it makes my eyes pop. I think it has the same effect on Kate’s eyes. She could probably wear less for daytime (and sometimes it looks like she does), but, again, I assume that the darker eyeliner style and amount is just what she likes to wear. I believe Bobbi Brown’s artists gave Kate some lessons before the wedding. However, she still wore a dark semi-smoky eye during the day – that’s why I think it’s simply a matter of comfort level and personal preference. I would really LOVE to see Kate wear a darker pink or reddish lip one time. It’s possible, even though she doesn’t have full lips. Pros: the color is beautiful. The tiny houndstooth check is imaginative. Her hair is nicely done up. Cons: the placket gaps. Her skirt is too short. Self-belts are dull. This could have looked stunning with a wide black belt. Of course, that would have emphasized the poor fit of the placket. I thought the matching coat/skirt combo looked near and classic overall . However, I never would’ve thought the coat was bespoke since it was a little tight across her chest. The skirt (kilt) looked very short, too short in my opinion. Plus, for some reason, when I think of a kilt, I think of a large plaid print, not dogtooth, with a big safety pin holding it closed and much longer, at least to right above the knee. The length of her boots always drive me nuts! I greatly dislike the wide gap between her hem and top of the boot. Wish she’d get boots that were longer and came right below the knee, or wore her hem where it covered just the top of the boot. I so wish she had never fired her hairdresser, James Pryce, who worked for her from 2011-2012. The best her hair ever looked, in my opinion! Richard Ward also was a good hairstylist, but it seems he’s been replaced by Amanda, who is kind of awful, in comparison. If you look her hair now verses pictures from 2011-2012 you see such a huge difference, especially when her hair is worn in an updo! Main difference is that the former stylist always gave her hair a lift in the front at the root and swept it back, where as Amanda seems to have difficulty with mastering the perfect updo and sort of plasters her hair down on the sides. A kilt is generally a tartan, which is woven to create a pattern of perfect squares. It is not printed. A kilt also has leather buckles and/or fasteners at the waist, plus a kilt pin to keep it together. This is not a true kilt, it’s a pleated skirt. I love everything about this look….especially the fact that it was so clearly suited to where she is today-Scotland! The kilted skirt (which I don’t think was too short, as it looked to hit about an inch above the knee), and the blue coat which put me in mind of the Scottish flag. I don’t think it’s a coincidence that she chose blue for a visit to Scotland. I didn’t see it mentioned but it looked like she had on the sapphire earrings that match her engagement ring? I will say that the bangs are a little bit too reminiscent of Farrah for me, but I do appreciate the judicious use of hairspray so that it’s not blowing in her face. Beautiful outfit on Kate! The blue color is flattering and the material is interesting. I love the combination of a coat with a matching fabric skirt. The black turtleneck makes the outfit youthful and updated. This whole week has been a win for the young royals! Agree Ellen. I love kilts and Catherine’s looked so good! I think Kate looked lovely today. Is this outfit similar to other things she has worn? Yes. But I still like it. I think the print on the coat at least made it a little different from other coats, like the recent Reiss one which was similar in color. I think the skirt in the same print was a great idea with a black turtleneck. She obviously loves this sweater since it has been popping up recently. I just wish we had more photos of her outfit without the coat. I am with others though that for a bespoke piece it should have fit perfectly. But that is a minor quibble. Overall this was a great choice. On a side note, I hope Kate goes back to a darker hair shade soon. I think the lighter kind of washes her out. I think a rich deep brown suits her features best. It looks like Kate was also wearing her watch. 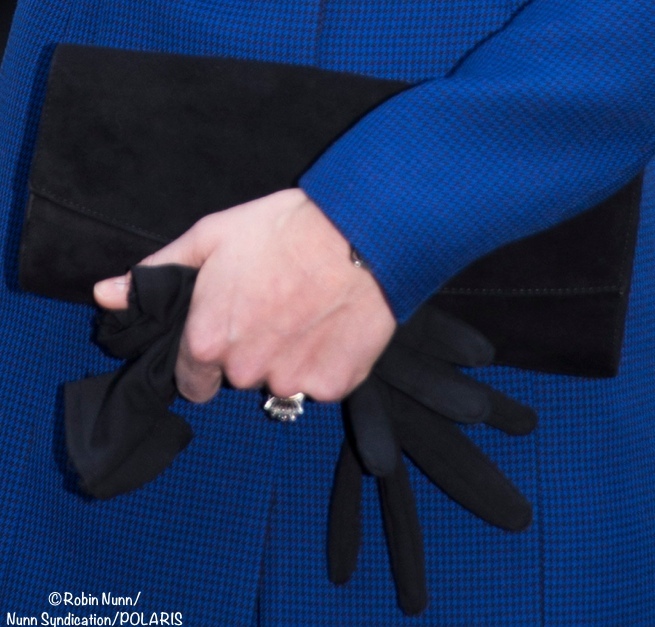 You can see it in the close up of her purse/gloves. The dial is peaking out. Agree, she looks stunning with dark brown hair like she had in 2011!! It completely changed her overall look! When it’s light brown she looks washed out…. Still, even in her worst hair day she is still a rockstar! Yes! My thoughts exactly! I so miss her darker hair and eyebrows. I love this look! The blue is a fabulous color, and I adore pleated skirts. I don’t think the interior of the pleats is any different than the rest of the skirt though- what appears black in some pictures is just a dark shadow. In the photo where she is sitting you can see that the inside of the pleats is the same color as the rest of the skirt. I so wish I could have her wardrobe! But what a great post. She looks lovely in blue! This coat gets thumbs up from me, for superb fit and colour, another adroit choice on Kate’s part. I agree the details are similar to the earlier Christopher Kane, but it feels very different given the textured fabric. I’m a big fan of the neat finishing touch of that narrow belt on a slim waist. I love the woven effect of the dogstooth, if that’s what it is, though it seems so fine it’s more like tweed, with its Scottish accent. And I’m so pleased to see Kate upping her game on the bespoke front for her royal outings, the days of the little brown Orla Kiely dress seem long past and rightly so. 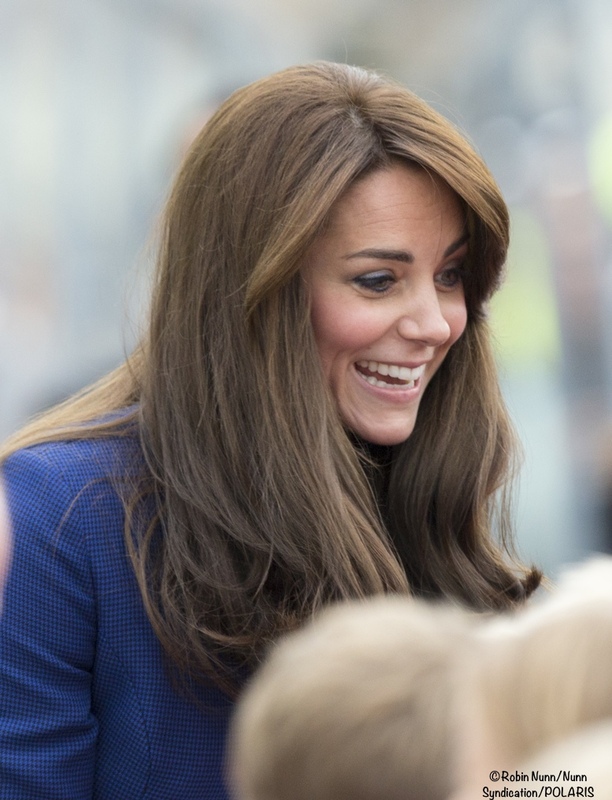 Kate’s hair continues to look wonderful and praise be for the growing fringe being under proper control. It’s always a pleasure to see those sapphire earrings. Other private niggles I harbour are minor; I’m not so keen on chunky suede boots, too much texture against the coat; fussy bows on gloves are too much clutter against the clean lines of tailoring, and the kilted skirt is too short. I have a personal dislike of the tawdry undertones that go with that style being worn that way and find it disrespectful of our national costume. The question was raised on WKWfb as to whether all skirts in Scotland are kilts or whether it’s just the one style. We do have normal skirts here as well and it is indeed just the one style which counts as a kilt. It should only be worn by men, hence the female style has been called a kilted skirt in the past. Nowadays the word kilt is used regardless in non-Scottish press though it can grate with those of us living among authentic Scots kilt-wearers. I love this look on the Duchess. The color is vibrant and I love the dogtooth fabric. The jewelry and accessories coordinate perfectly. I think the boots are fine. They are warm and look cute with the kilt-like skirt. The skirt could’ve been a smidge longer, but paired with the turtleneck I think it is a very classy, yet cute, look. The color and fabric of the coat are beautiful, but I cannot believe the poor fit across the bust! And, as a seamstress, I know that it could have been easily improved by moving that button just a bit to Kate’s right! Also agree, the skirt is too short and “school -girlish.” A bit more length would have been better. I agree with you. Placket fronts have to fit perfectly, otherwise they gap. That was the first thing I noticed. It also may gap because it doesn’t fit properly in the shoulders. I also think the skirt is too short. 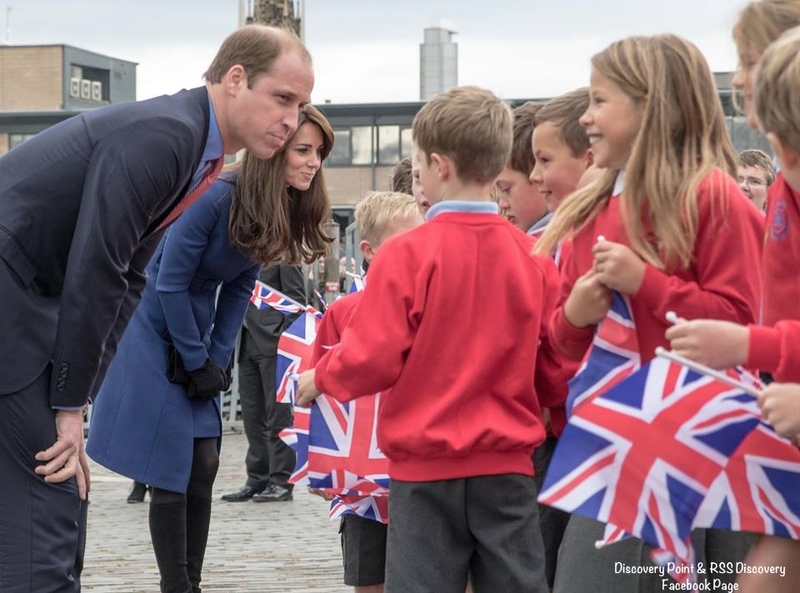 As you can see by the photos, both she and Wills are squatting down to talk to children. You can’t risk flashing the little ones in a short skirt. Yes, short pleated skirts are a look, but I would have gone longer with this. An outfit like this used to be called a “walking suit.” I have a coat and matching skirt in tweed that’s great for traveling, because the tweed wears like iron. This is a fabulously detailed post and I didn’t even notice any sort of delay so please stop apologizing! Your posts are always thorough and thoughtful, and it is even more admirable that you managed to do it with a poor internet connection! This always has been and always will be my favorite “Kate” site for detailed, accurate information not only about her clothing but about the places she visits as well. Well done! Beautiful coat and skirt. I think a nicely tailored jacket and pencil skirt would have been a much better look for Wednesday’s engagement. I couldn’t help notice what excellent posture Madame Peng has–she carries herself well. Forgot to mention her hunky new security guy in the first photo. He never took his eyes off her! He looks like Vladimir Putin’s younger brother, frankly. It’s uncanny. Do I see some blue eyeliner?! I can’t tell if its the lighting or just picking up the blue in the dress on my screen, but if so, I LOVE it. The eyeliner is black (it’s Lancome Hypnose, to be exact.) It’s a more soft black, but it’s her standard black nonetheless. Navy eyeliner would look beautiful on her though as it does bring out blue eyes more. What makes the liner look blue is the brighter white-ish like color on the lid. Since we know the palette she goes to for events and outings is the Urban Decay Naked palette, I can pretty much tell you that the lid colors are most likely Sin on the inside corner, Naked with Sidecar lightly tapped on top on the lid and Smog for the outer corners/crease with a bit of Buck. MAYBE Darkhorse. I use the palette religiously for horse competitions and I used to use it daily for school. I’m VERY familiar with the colors. I honestly should play with that palette to see if I can recreKate the Kate smoky. I’m thinking I get close for competitions as those are the colors I use and don’t realize it. I try not to put in anything that is only from “rumored insiders” (who are these insiders? Hm?) but these are ones her hairstylists and she herself has said use. Now, I will tell you right off I guesstimated which colors she used from the Naked Palette. I’m very familiar with it as I own it. I’m also an image-based autistic, so I can normally match colors to colors very easily if I know them well enough. Her eyes are close to what I do for competitions (and so those colors are basically hitting pan), so I’m very familiar. It would be neat to know WHICH colors she uses regularly for her day and evening events. I love the style and colour of Rebecca’s dress in the background as well! Such a flattering colour and shape for Kate. She has been so on point this week with the red, burgundy and now bright blue! I’m a Christopher Kane fan and also a huge fan of matching coat and skirt ensembles worn with a sweater (I own half a dozen high-necked black sweaters like that one that I wear all the time), so this look is a winner for me. I’m reminded by this outfit of a killingly-successful camel coat and skirt ensemble, worn with a black top and boots, by Michelle Obama, shortly before her husband’s inauguration in 2008. I believe it was by Narciso Rodriguez, another designer I admire. Sadly, I’ve learned that such outfits are rarely available at reasonable prices. You either have to buy one offered by a very pricy ready-to-wear designer, like Kane or Rodriguez, or have one made, and having coats custom-made is an expensive proposition. The best I’ve been able to do up to now is a color-coordinated skirt and coat look, though I recently managed to score a winter-white pencil skirt that exactly matches my winter-white coat, so I’ll be wearing them together soon! 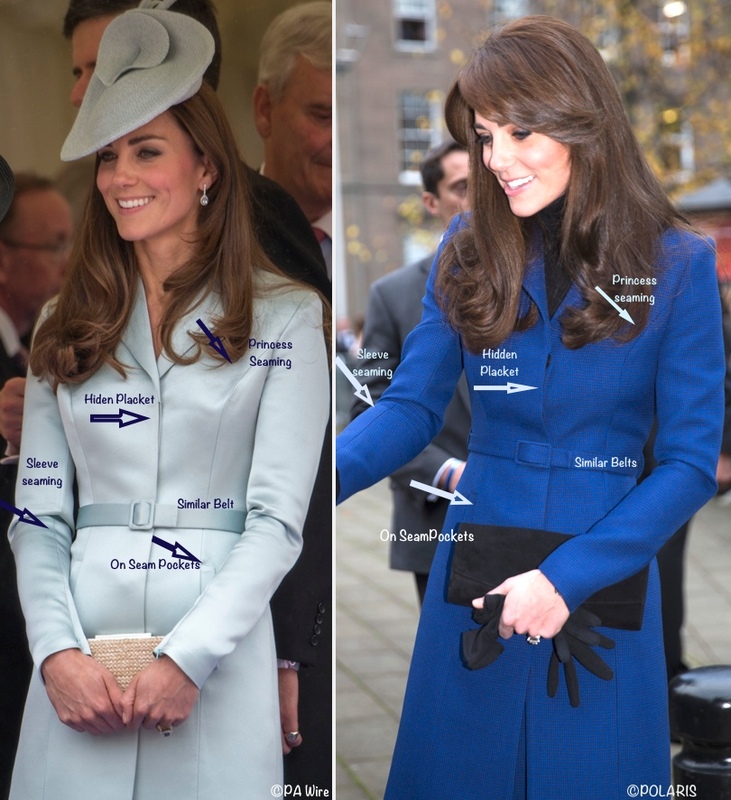 I very much liked the lines of the earlier Kane coat but felt the ice-blue wasn’t really the Duchess’s color. This rich, intense blue, of course, is one of her favorites, though I could have wished that she’d experimented with a new and different shade. We’ve seen this color so often, though I do like the dogtooth fabric. My other quibble is that I think the kilt is too short. Another couple of inches would have added chic to the look. My complaints are very minor ones. All in all, I think the Duchess looks terrific. Of course, some people by now have seen quite enough of the boots, but I think they work very well with a coat, skirt, and sweater outfit like this one. I repeat: her hair needs a trim. I agree that the skirt was a wee bit too short, even with tights. I think it would have looked more sophisticated being a few inches longer. For a bespoke piece I am surprised she didn’t make it longer. This is a great colour for Kate and while I have never been a huge fan of the Rhumba boots, they are clearly comfortable and warm and that is important. I like her hair better today … the bangs seem lighter and frame her face nicely. My only complaint is the way the coat pulls at the bust. This is a custom made garment and there is absolutely no way that should be happening! That’s true. I meant to note that the coat does pull a bit across the chest, which is a surprise, since the other Kane coat doesn’t have that problem. It makes me wonder when this ensemble was made. Could it have been before breastfeeding made a difference to her bust measurement? Breastfeeding means that your bust measurement is a constant roller coaster, so it could have been made this morning fitting perfectly and by this afternoon be like this. I agree–a bespoke version of something should fit much better than this coat does at the bust. Oy. I suspect Kate of having outfits fitted for wearing without layers and then finds herself in draughty situations like Thames barges or a day out in Dundee where she sneaks on a thicker top, like a polo neck, and gets these pulled buttons. She’s done it several times. I agree it’s a touch bizarre touch when you’ve forked out for the bespoke number, but then Kate’s small mishaps keep her delightfully human and not image-obsessed. I wear polo necks like that all the time, and they are very thin — certainly not thick enough to result in pulling across the bust that way. You can see in the picture in which she’s not wearing the coat that the sweater isn’t at all bulky — far from it. It looks just like my thin, black, merino-wool sweaters, which all come from J Crew, by the way, if anyone’s interested in buying one like that. Appreciate your point, I too have a few silky polos for the same reasons of layering. I’m just hazarding a guess that as a southerner venturing north to Scotland she may have expected to freeze and could have had a further layer on, even under a slinkytop. Or as someone else has pointed out she may still be feeding her infant daughter with consequential shape changes. But even that doesn’t explain the number of times this happens on her coats. There was that lovely navy double-breasted McQueen she wore an Irish Guards day in 2011, well before baby time, which pulled all over the place. As you say, something amiss in the tailoring department perhaps. 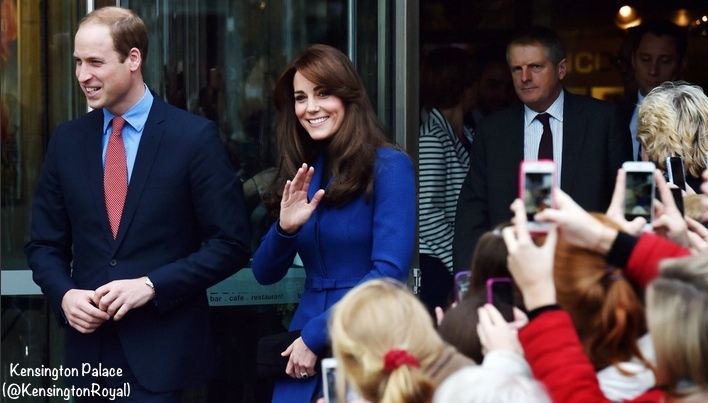 I love the royal blue and black coat/dress combo – the colors and accessories are perfect for her. I prefer the slightly side parting on her bangs instead of that dead-center part. However, I think her no-bangs hairstyle was so much more flattering in the pic from the Olympics gala (the pic where she’s wearing the light blue coatdress and holding Champagne). Perhaps she’ll grow the bangs out again, after the post-baby hormones have stabilized. I like the Olympics gala hair too. Besides the absence of bangs, I think the color is richer and she just seems to have more hair. It looks to me as if she could be wearing a fall in the older picture as well. Maybe that is why her hair appears so different now? As for the coat, the color is fabulous and the pattern makes it special. I think it looks particularly nice from the back. I’m a big fan of kilts, so pleased to see the matching skirt. I think part of the issue is her hair is thinner, especially since she had that fringe cut, which takes away some of the volume. The other issue is her change of hairstylists over the last few years. Both James and Richard were so on point with her entire look and style. Experts on color, cut, volume and length! I don’t think she ever wore extensions then, they just knew how to work with her hair type. Amanda, on the other hand, is extremely inferior compared to James and Richard. Hi Suzy Q, I agree that the two previous stylists were superior and that this current cut isn’t doing her favors. I am fairly sure she is wearing a hairpiece in the above Olympic gala picture. If you look closely, her hair in the front is darker than the hair on the back of the top of her head and what is falling down around her shoulders.To me, she seems to have her own hair pulled back and the hairpeice attached mid part line. There were also pictures and video at the Queen’s jubilee with Kate was in the red McQueen on the boat adjusting an extension on the back of her head. While I don’t think she used them all the time, I think that really full opulent look she used to sport was at least in part due to extensions and hairpieces. Only she and her stylist know for sure though. I think the length is fine too ali. They are definitely having trouble with the color. She might be trying to hide her grays with an organic color and they just don’t perform as well as good old chemicals. The color seemed richer and not as ashy at the Harrow engagement but maybe its just the lighting. Love this look! I think that the belt buckle might be the same one, just turned on it’s side! (Not sure if that’s really a thing, but it looks that way to my eyes.) Something I have been thinking about ever since we saw her at the State dinner is…maybe her fashion sense is picking back up now that she’s not in mummy-to-be mode. She’s had her two lovely babies, now she can be back on track with clothing. I feel like her red dress was somewhat of a daring choice, though I understand the symbolism. Her purple dress the following day was a nice step away from buttoned up coats that we’ve seen so much of the past two years. And this new ensemble is gorgeous and I really like that it’s a small checked pattern. She seems very confident and looks so much better since her fringe has been thickened a considerable amount and her hair darkened for winter. I also welcome the open neckline on this coat even though she’s promptly filled it up with the polo neck. Buttoned-up coats are a bit monotonous, I agree.